Meghan Markle, the Hollywood actress, liberal activist and future Princess of England, has “disowned” the brother who helped raise her because he is an “embarrassing Trump supporter,” according to British reports. Meghan Markle isn’t winning the British people over, and with behavior like this from the Hollywood actress, it isn’t any wonder. According to the British press, the 36-year-old divorcee they have dubbed “Princess Pushy” feels superior to her own flesh and blood now that she is engaged to Prince Harry. 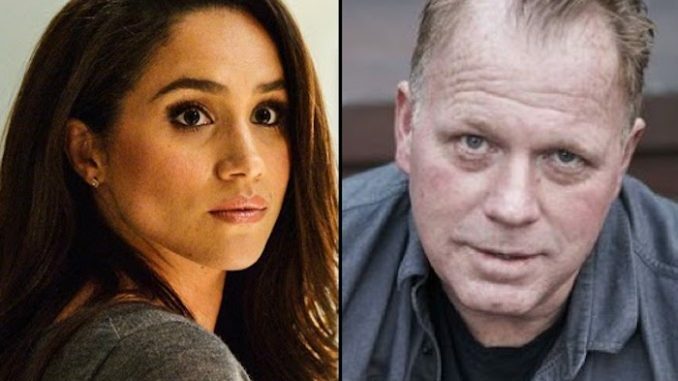 Meghan Markle has even gone so far as to deny knowing her own brother, Tom Markle Jr, after he reached out to her for help in dealing with the “extreme media scrutiny” that has come along with her very public engagement. Explaining that he has had to move house three times to get away from prying tabloid journalists since his sister got engaged to Prince Harry, Tom told In Touch that Meghan cut off contact with him shortly after the engagement. Now she only speaks to him through her lawyer. “My lawyer had a phone meeting with her lawyer, and he emailed me some of [Meghan’s] direct words. Tom Markle said he reached out to his half-sister in a touching letter, to congratulate her on her engagement to Prince Harry, 33, and apologize if his life or politics had “caused you any embarrassment“. But Markle says Meghan, 36, never responded to his heartfelt note. And when her brother attempted to reach her by contacting the palace of her soon-to-be-in-laws, he learned she wanted nothing to do with him. “There was a time where people were following me around at work, taking pictures and posting horrible stories about me and my family saying I’m a white supremacist, a drug addict and a dealer, all this crap that just isn’t true,” the Trump supporting Markle explained. Tom finds it “ridiculous” that Meghan thinks of him as a stranger. “I spent a lot of time with her growing up,” explained the 51-year-old, who was 14 and living with their dad, Thomas Markle Sr., and Meghan’s mom, Doria Ragland, 61, when Meghan was born. Tom Markle Jr. pictured with Megan when the future princess was a baby. Markle’s huge problem is the liberal politics she spouts. We all know about her hatred of President Donald Trump. In May 2016, she appeared on Larry Wilmore’s show and vowed, if Trump won, she would “stay in Canada,” where she was filming her TV show. Of course this didn’t happen. Like all of the celebrities who made the same claim, Meghan Markle did not stay true to her word, hot footing it back to Los Angeles, and setting her sights on finding a new man who could push her career to new heights. Soon after Buckingham Palace announced Prince Harry and Meghan Markle’s engagement, reports surfaced which called into question the Hollywood celebrity’s motives for wooing the British royal. As more and more information came out about the “Suits” actress, a clearer picture of her past was painted, and many feared that Harry was being duped by an attractive opportunist who has mastered the ability to disguise her real intentions. After all, Harry wouldn’t be the first young man to be blinded by the promise of love. It appears that Meghan has been able to manipulate Harry considerably. Indeed, this is not her first time at the rodeo. Meghan has been married before, to a Hollywood producer no less, while she was scrambling up the greasy entertainment industry pole in Los Angeles. However she abruptly divorced her husband when she realized she had a shot at Prince Harry and a greater degree of world fame. She’s not new at this game — the California native knows how to get what she wants, and she has a history of taking advantage of men who can elevate her celebrity to new heights.